What do you want more than anything during a hot Summer day (besides popsicles and an ice cold beverage). . . . . Something light and refreshing that doesn't require you to turn on your oven. This is that perfect recipe. It's healthy, yet fills you up and doesn't leave you filling weighed down. If you have leftover chicken around, you won't even need to turn on any appliances. I found this idea over at Sweet Little Smoothie a few months ago and have made these at least four times already!! Since Summer is going to be over soon, I figured I better get this recipe posted. You can make these with whatever your favorite veggies are or whatever you have in your fridge. 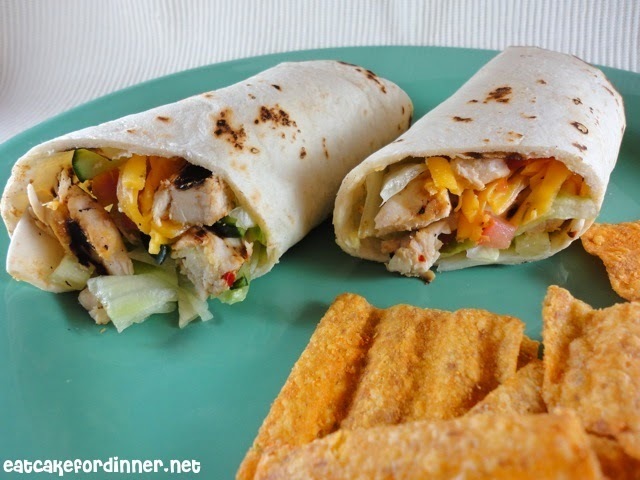 There are so many possibilities with these chicken wraps. This is my favorite version so far. Place chicken tenders in Italian dressing and let marinate for at least 30 minutes. Cook on the George Foreman or outside on your grill. Cut into strips. 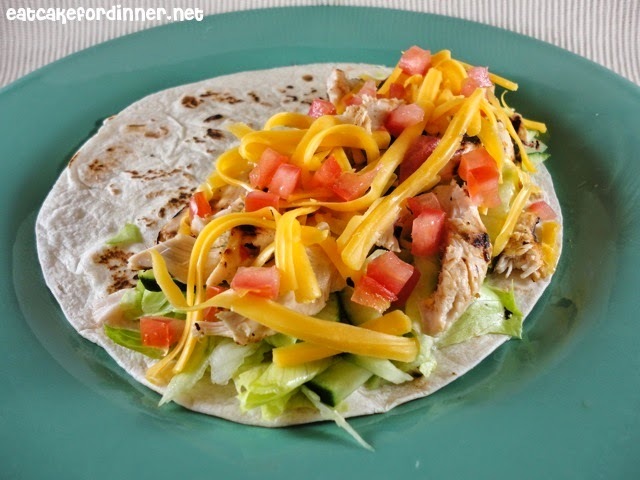 Layer your tortilla, lettuce, chicken strips, cucumber slices, tomato and top with cheese. Drizzle with more Italian dressing. Roll up, cut in half and serve. Yield: 2 chicken wraps. *These ingredients are more of a suggestion, so adjust them to your desired taste. Switch up the dressing, the tortillas, the meat, the veggies (roasted red pepper, onion, mushrooms, zucchini, eggplant, asparagus) and the cheese. Use however much of each ingredient you desire!! Looks easy and delicious. My kind of recipe! Oooh! These look DELISH! Thanks for posting... I have no doubt that I will love it. Oh, and my family too. This looks yummy and great for an easy dinner! Most of us have all this stuff at home already! This is a great recipe! I'm going to pin this for later use. These sound (and look) wonderful! Perfect for any summer day! (I'd like them right now for breakfast, as a matter of fact!) YUM!!! PS - the mint Oreos were a hit in the Dreamy Oreo Brownies. They added the perfect amount of flavor! Thanks for visiting! Like it! I love to cook daily and this is the recipe for Wednesday. I had these for lunch today! All the salad munchers looked jealous....and let's face it, yummy chicken wraps will always beat some soggy lettuce thrown in a plastic tub! I'm a fairly recent chicken wrap fan. These would make a quick weeknight dinner. Thanks.